Photo Caption 1: Students from various schools in Bangalore busy solving Maths-Science Olympiad in teams. Photo Caption 2: Excited students pose in front of the camera after winning trophies in the Olympiad. 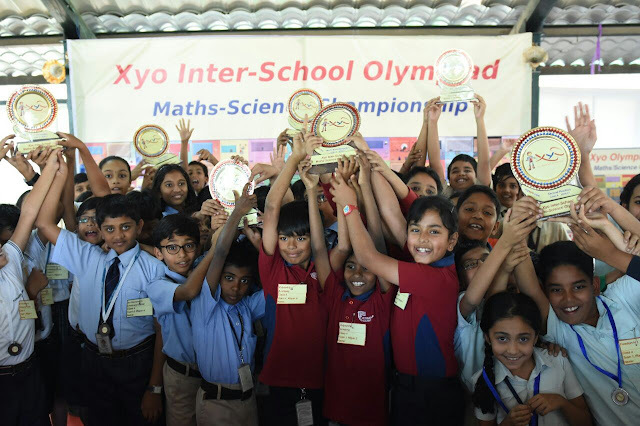 19th February, 2017 Bangalore: In brain-racking sessions, junior champions from Bangalore took part in Xyo Inter-School Maths-Science Olympiad held on 18th and 19th February at Karnataka State Hockey Stadium. While these children engaged themselves in mind boggling sessions of Maths, their parents got tips on adopting healthy eating and healthy lifestyle, managing sports injuries and health emergencies in children from doctors of Columbia Asia Hospitals, Whitefield, which was the health partner for the event. This 2-day event saw participation 800 students selected from over 15,000 students from 25 schools. The format of the Olympiad was in the form of a computer game where one team competes with the other, making it extremely exciting. The mathematical level of questions was from the syllabus, while the context was something quite different to make Maths come alive for the students. Each team got a chance to decide on the type of problems, they want to attempt: knowledge based or analysis based. They had to work together as a team and derive at the correct answer, faster than the opponent. The pairing and the decision of who plays the game was very similar to a sporting tournament. Points were based on getting questions correct as well as the number of milliseconds by which the team is faster than the opponent. Teamwork, accuracy and analytical thinking were the attributes that made one team get ahead of another. The event was free for participation to students and schools. Top three positions in class 4,5,6 has gone to students of the following schools- Harvest international, Freedom International, Deens academy, SSRVM North Bangalore, Sri Kumarans Children's Home, NPS Indiranagar. Dr Shailaja Sharma associated with NIAS, IISc was fascinated with the format. “This is fantastic that children are learning to work together as a team and are so excited and happy while doing mathematics,” she said. “The Xyo Inter-School Olymiad is organised very well and we are happy to let our students participate in the program. The organisers are efficient and have made sure all communication reaches us well on time. Wishing this year's edition all success,” said Jayasree Ramesh, Principal Sri Kumaran Public School. “The children today are exposed to much more than the previous generation. The problems in the Xyo Olympiad are different and unique. 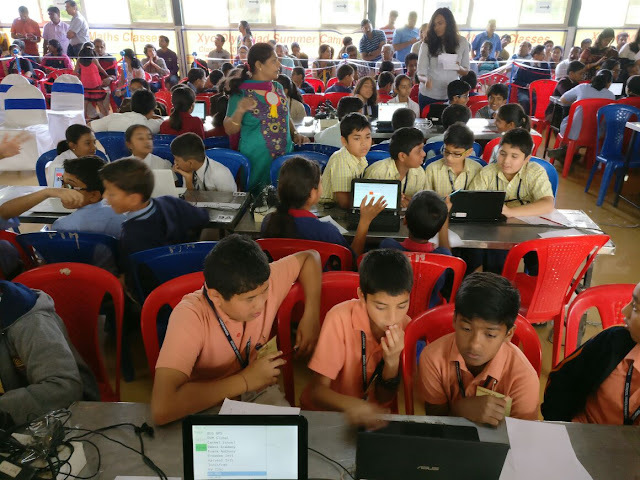 Being part of this event, helps the students to choose a career path in Mathematics,” said Mrs Chandrakala, Principal, Sri Kumaran Public Academy. 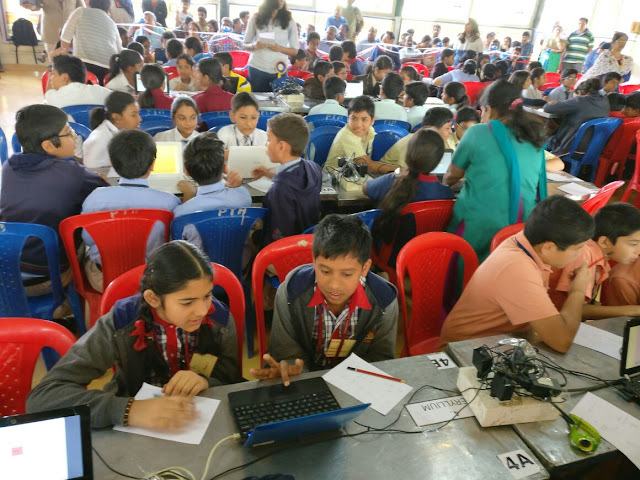 Middle School students across Bangalore have taken to the fourth edition of this event with the right attitude. They would love to win, they can take losing but most of all they love to play. Columbia Asia Hospital, Whitefield was the healthcare partner for the event where free diabetic camp was organised by the hospital at the venue. Around 1600 parents of the children who participated in the event were screened at the diabetic camp. Doctors from Columbia Asia Hospital also engaged in insightful conversation with the parents. Addressing the parents, Dr. Firoz Torgal, Consultant Emergency Medicine, also delivered an informative talk on common emergencies. Dr. Suruchi Goyal Agarwal, Consultant Paediatrics and Paediatric Endocrinology, engaged in an interaction with parents on the topic ‘Why my child is so tired?’ Dr. Sandeep Dhar, Head Physiotherapy & Rehabilitation, guided parents on the assessment and management of sports injuries in children. About Columbia Asia Hospitals Pvt. Ltd.
Columbia Asia Hospitals Pvt. Ltd. is the only company in India to utilize 100% foreign direct investment (FDI) route in the hospital sector. The Columbia Asia Group is owned by more than 150 private equity companies, fund management organizations and individual investors. The group currently operates eleven facilities in India and has presence in Ahmedabad, Bangalore, Gurgaon, Ghaziabad, Kolkata, Mysore, Patiala and Pune. The company also operates hospitals in Malaysia (11), Vietnam (3), and Indonesia (3). The Indian management operations are managed from its office in Bangalore.